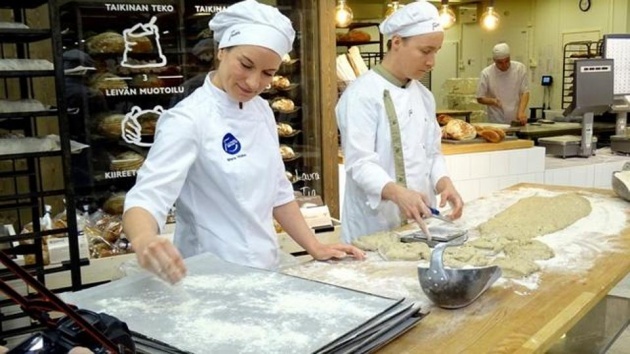 A Finnish bakery and food service company, called Fazer, launched on Thursday what it said was the world’s first insect-based bread. Made from flour ground from dried crickets as well as wheat flour and seeds, the company claims the bread contains more protein than normal wheat bread. Each loaf contains about 70 crickets and costs 3.99 euros ($4.72), compared with 2 to 3 euros for a regular wheat loaf. “It offers consumers with a good protein source and also gives them an easy way to familiarise themselves with insect-based food,” said Juhani Sibakov, head of innovation at Fazer Bakeries. The demand to find more food sources and a desire to treat animals more humanely have raised interest in using insects as a protein source in several Western countries. In November, Finland joined five other European countries -- Britain, the Netherlands, Belgium, Austria and Denmark -- in allowing insects to be raised and marketed for food use. Sibakov said Fazer had developed the bread since last summer. It had to wait for legislation to be passed in Finland for the launch.